"Forty is the old age of youth; fifty the youth of old age" said Victor Hugo and Groucho Marks believed "You're only as old as you feel". So what age is old age? According to a survey in The States by the Pew Research Centre for Social and Demographic Trends, they found that (not surprisingly) perceptions of the onset of old age vary widely according to the respondent' actual age. People under 30 believe that old age strikes before the average person turns 60, whereas middle aged respondents said that old age begins at 70 and adults aged 65 or older put the threshold closer to 74. Interestingly gender made a difference in the findings too. On average women said that a person becomes old at age 70, whereas men said that old age is closer to 66 years of age. Previous research in Britain to determine when a person was "offically" old revealed the magic number was 66. However most of the 60 somethings who took part in the survey said they didn't feel their age with the majority claiming the age they feel closer to is actually 52, 8 years younger. What we do know for sure is that we are all living longer, healthier lives n what we think of as old has changed over time and it will continue to do so. Researcher, Dr Sergei Scherbov points out that "Two hundred years ago, a 60-year-old would be a very old person" and he would argue that "Someone who is 60 years old today, is middle-aged. 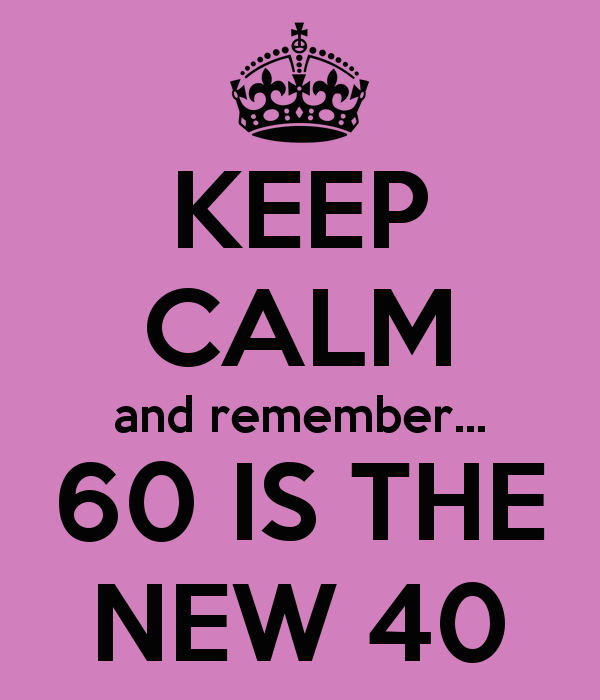 So there we have it, 60 is the new 40! We don't just have to take the word of researchers; the evidence is there for us to see. Dame Judi Dench at 83, is as popular as ever and she continues to grace our screens, so too with Helen Mirren who is 72, while Tina Turner proved she was still 'Simply the Best' by being the oldest person to appear on the cover of Vogue aged 73. There's a similarly impressive list of celebrity of celebrity men who are redefining old age, Robert Redford at 81 and the singer Sting at 63. But this club isn't exclusively for celebrities and the rich and famous it's also evident in the way that companies are focussing their marketing strategies to attract older consumers, recognising the value and infludence of older individuals. As for my own view of 'old age', it is in line with the British lawyer, statesman and philospher Francis Bacon who once famously said "Old age is always 15 years older that I am", and I am sure there are many who would agree.